Have you ever heard of that? Thanks to Pinterest, I have. And I wanted one so that I can get a “display” table and some much needed extra space/storage for books. It looks so pretty and it is a great alternative to those without a lot of floor space to have a coffee table in the middle of the sofa set. Since then I have pestered Kei to draw a “plan” for the said table. Sure this will not be a DIY-since we dont have the woodworking skills and tools, but I wanted to get a close to accurate shop drawing with measurements so that it would be easier for the one making the table. Less margin for error. Also wanted the table to have electrical outlets on both ends so we can charge phones, place a lamp…etc. 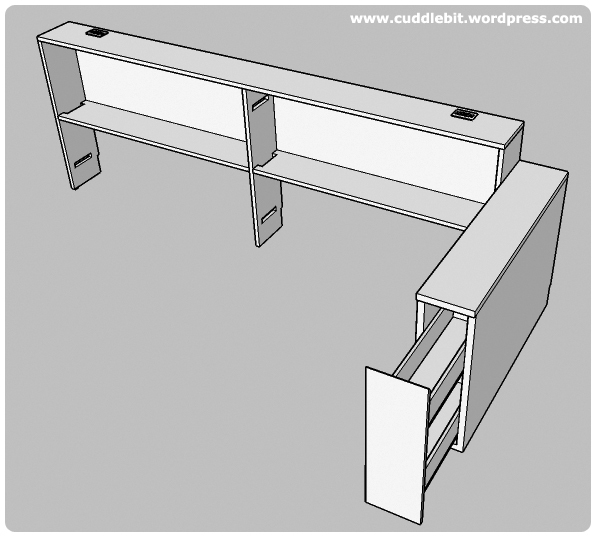 Kei’s initial drawing of our behind the couch table -We went on to modify the drawer part. Once we have the drawing it is off to the furniture shop. It took about three weeks before it arrived, right before Christmas. It was huge. Freshly delivered -we still have to find faceplate for the outlet. Our little tree fits right on the side! Then the holidays came and we got busy and forgot about “decorating” the table, until now. We sorted out our books, bought some basic bookends and placed them on the table. 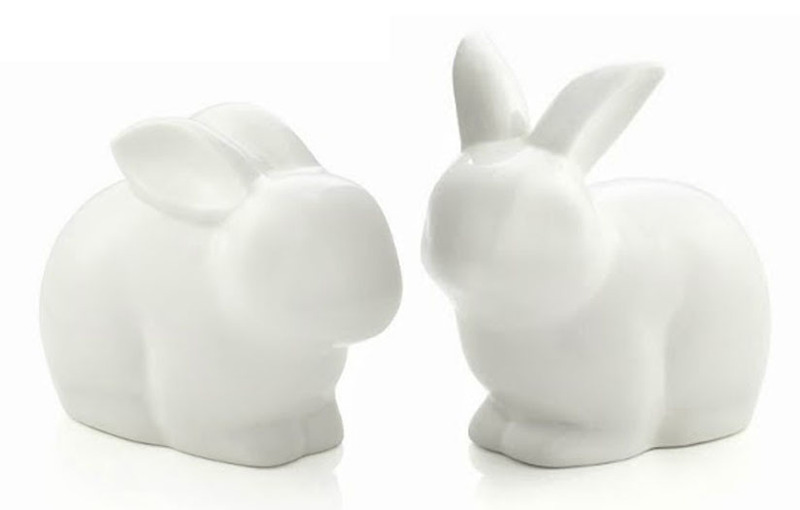 We also moved our ceramic bunnies from the dining table to this ‘behind the couch’ table. They now guard our books. Freeing up much needed space in the dining table. Next would be looking for lamps to be the accent piece. Just last weekend, we found it. 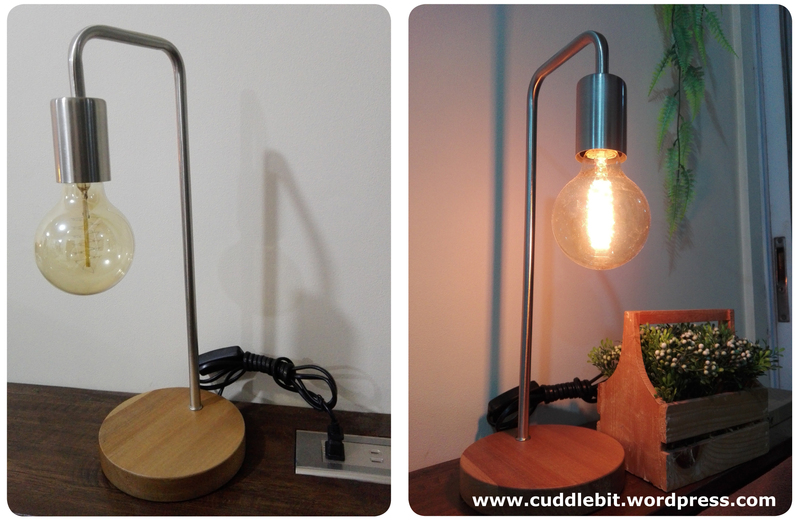 Minimalist arc table lamps with edison bulbs. Looking good on and off! 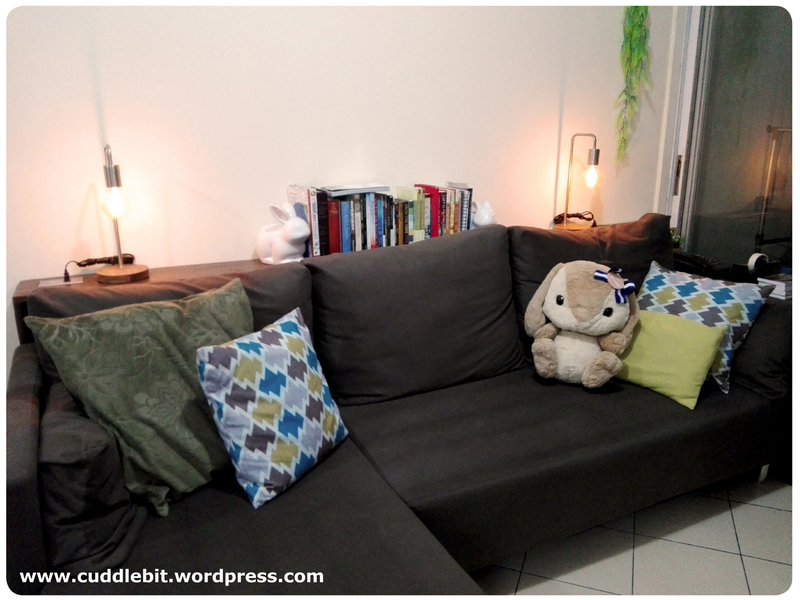 So after a long while, the living room is looking a bit more homey/cozy. We can still fit some decorative items in! -a few picture frames on the table would be good & maybe something huge for the wall would be nice in the future. Any suggestions for wall decor? That is all about our small home improvement for now. Till the next. 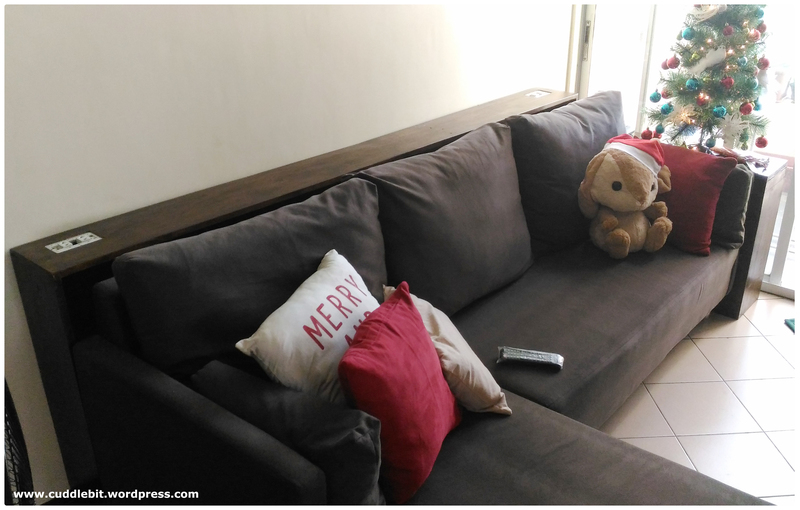 Categories: home, life | Tags: behind the couch table, console table, custom, furniture, home, home improvement, manila, Philippines, table | Permalink. One day, I woke up to realize this. That is my wedding band on my finger. I am now getting fatter! Yikes. 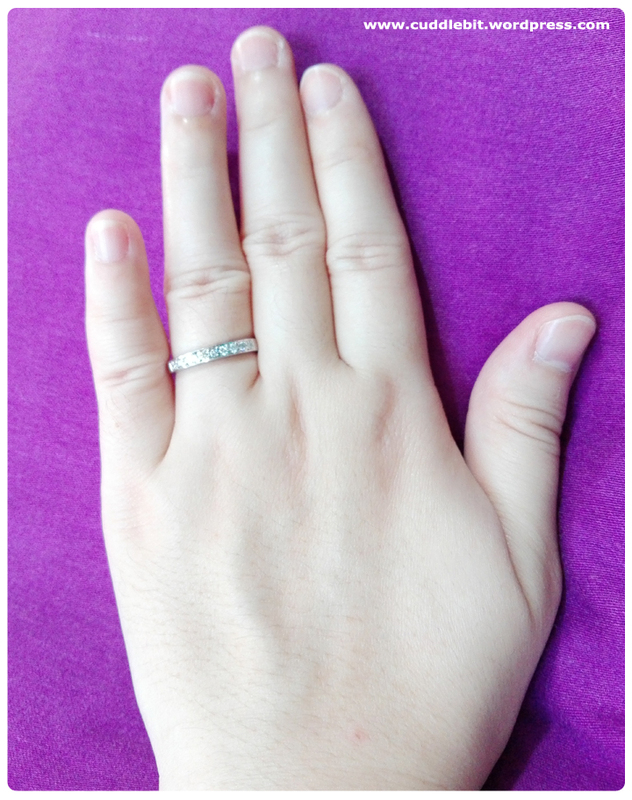 While I was not that bothered about getting a bit fat, I was real sad that I cannot wear my wedding band. 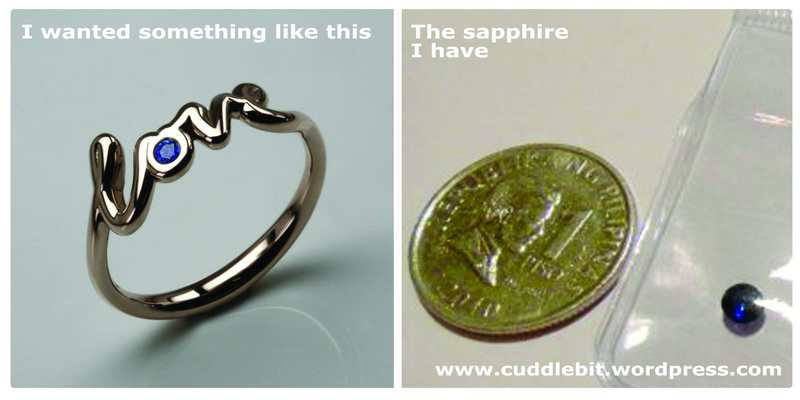 I love my bling of course and I wouldn’t want to remove it. What was I to do? 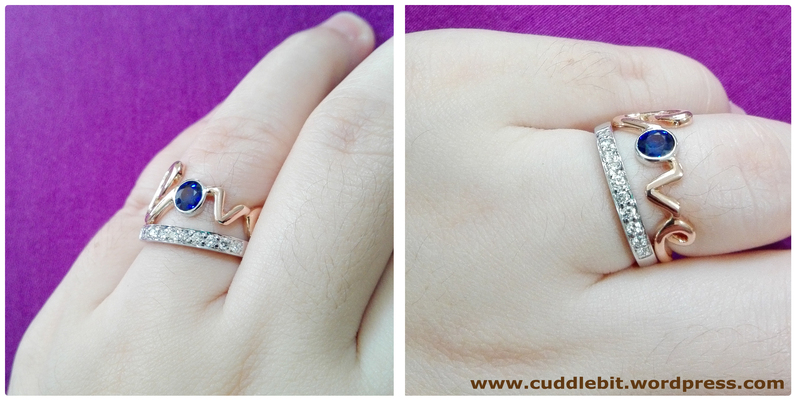 Get my band resized! ASAP. So, off we went to see our church mate Atchie Helen -who has a jewelry shop and also the one who made our wedding rings. *For those asking: Atchie means sister in Chinese. We gave her our rings. Mine to be re-sized a size bigger, Kei had his ring cleaned. And because she made our rings, our re-size is free! Thank you so much! *But just to make it clear, she also does a re-size for rings that are not made by her for a fee. Then the stones of my wedding ring was counted, then the ring was weighted – all of that was recorded. 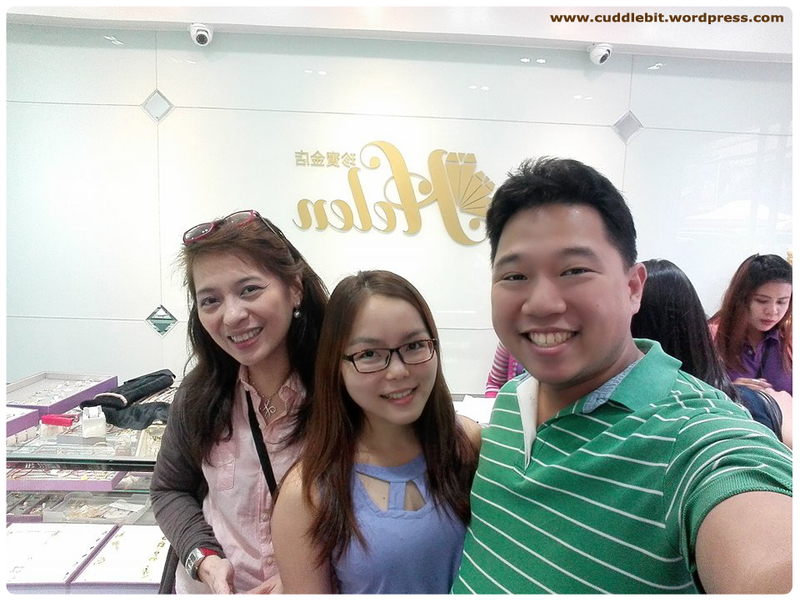 -She explains to us that when the ring comes back they would check it for the stones and the weight – ensuring that there is no switching or getting a lesser gold/value. She is thorough, careful and clear like that. So, you can rest easy that you are not going to be deceived! Next, I also asked her to create a ring for me. Gave her my tiny sapphire and a peg of what I wanted. remember this? my tiny sapphire is about to be made into a ring! I was honestly worried that my sapphire is too small but contrary to what I fear, Atchie Helen told me that it would do well and is actually a big stone for the design I wanted. To compensate, she will make the whole design bigger. Atchie Helen then helped me with picking out the metal, we opted to make the ring in 14K rose gold (to contrast the blue color-14K gives a pink tint I wanted, going with 18k would give it a deep saturated pink that I did not like) with white gold bezel to clearly show off the navy blue of the sapphire. I appreciated this part as if it were all up to me, I wouldn’t have thought of all that. She even educated me about jewelry and jewelry design in the process. Awesome. The price of my made to order ring? The original peg has a price of almost 40K. 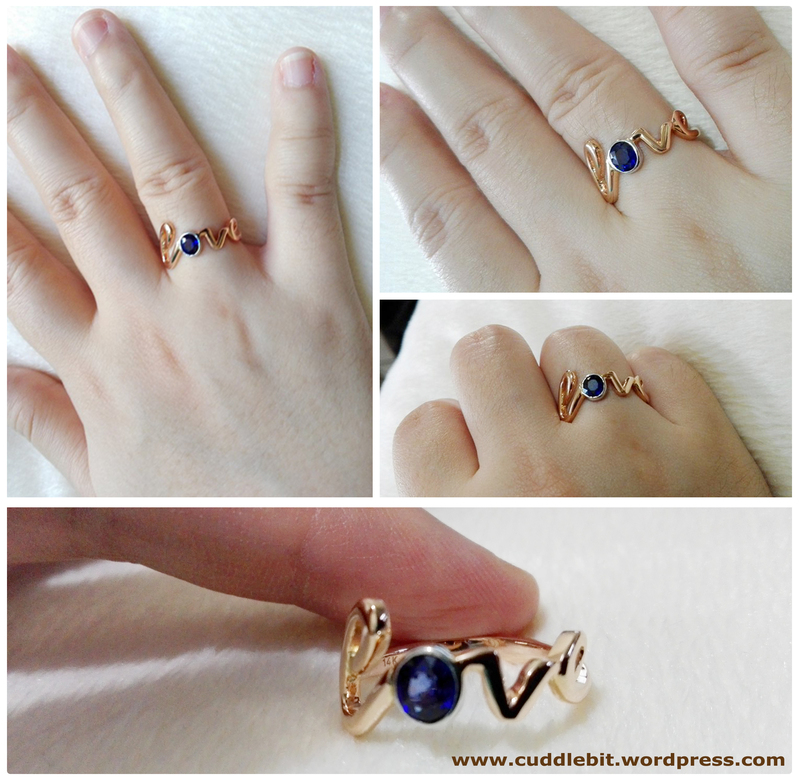 14K rose gold and a (smaller) sapphire. (*the peg was a British design hence, the huge price tag.) With all the customization and enlargement of the design, Atchie Helen gave us a price below 15k. Sure I have my own stone but, that was a huge price difference. *Even if you cut the price of the peg into half, the quoted price was still way more affordable! 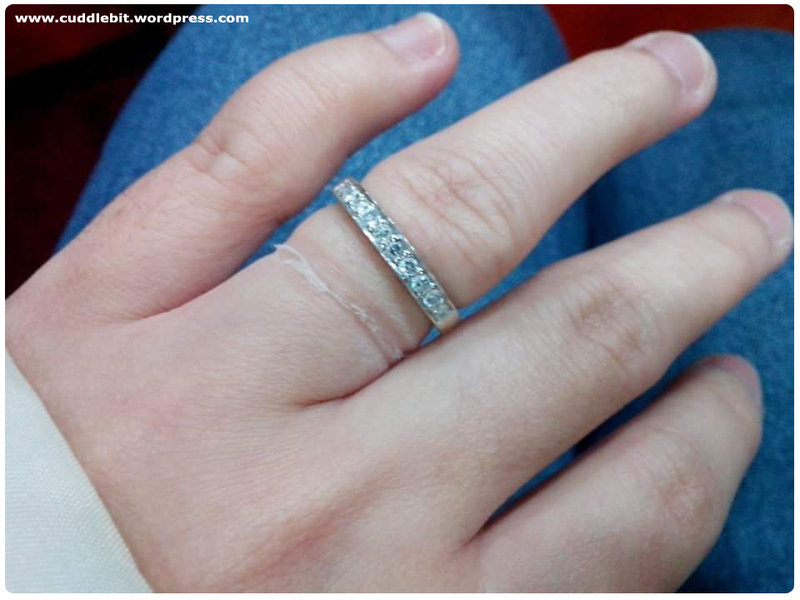 Then after a few weeks, we got a message from her telling us that our rings are ready to be picked up! Euphoria!!! 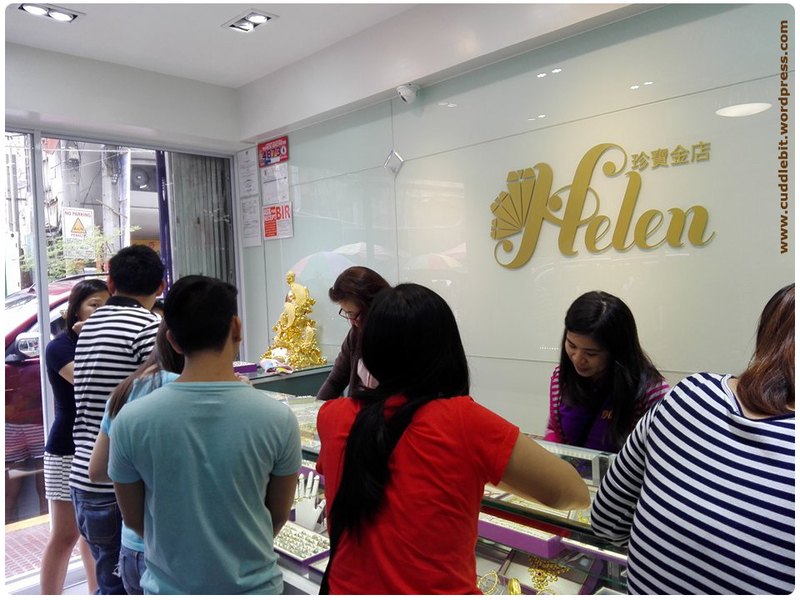 I was excited to go get my rings and see her and also go to her new shop at Ongpin! I have been waiting for this! I could stay here all day! We arrived to see this. I really dig the look of her shop! Bright, modern and it has the space a lot of jewelry stores lack. Full house. That is Atchie Helen, the one wearing glasses. This is a normal scene at her shop. After all Atchie Helen gives the best price and the best quality. She is comes from a family of jewelers (her dad and grandpa are jewelers too) and very much knowledgeable in precious metals and colored stones, but her expertise is actually diamonds. She designs the pieces she sells and can do made to order pieces! The shop carries jewelry for just about everyone, young and old, male and female. Necklace, bracelet, rings, earrings, pendants, pearls, gemstones, diamonds and even corals for babies! There are also statement pieces and sets that doubles as a good investment for the future. *So guys if you are looking for engagement rings, you know who to look for. She can very much find you a diamond within your budget. Just show her your peg and you will be amazed at her selection! There are also colored stones that look absolutely pretty! Trust me. She even accepts repairs and re-fashioning of old jewelry into modern settings. After all that gushing, here is the big reveal! 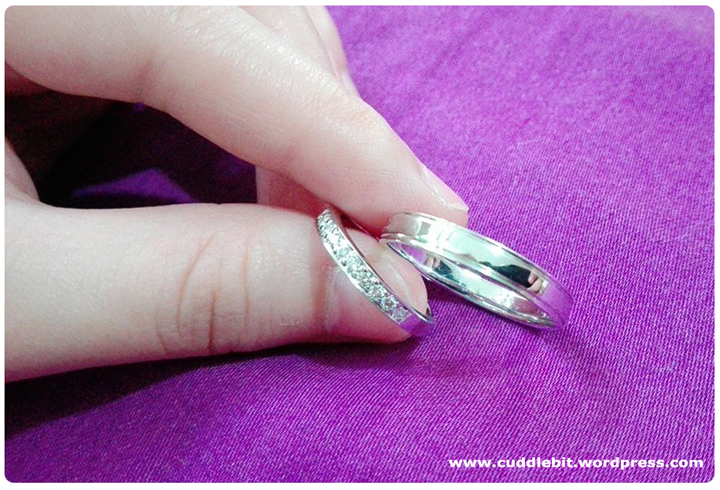 Here is our wedding rings!-Mine is re-sized and Kei’s was cleaned. Looking good, even better when worn. The photo does not do justice to the brilliance of the ring. Feeling like a hand model. finally a perfect fit! Just beautiful. Comfortable too! Now, on to the next ring! Wow! I said that aloud when I saw the final product of my made to order ring. It was bigger and better than what I expected it to be! It looks good together but admittedly a bit much. hahahaha! So I will be wearing the wedding band on my left hand and the sapphire ring on my right. Before we leave the shop, we requested to have a photo with Atchie Helen. 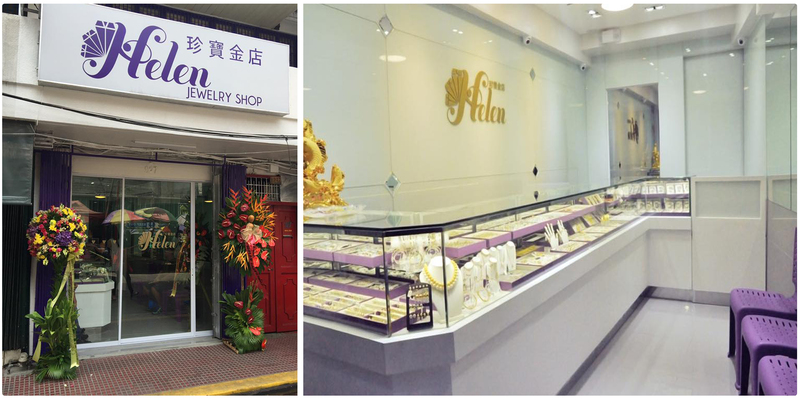 meet our favorite jeweler Helen! 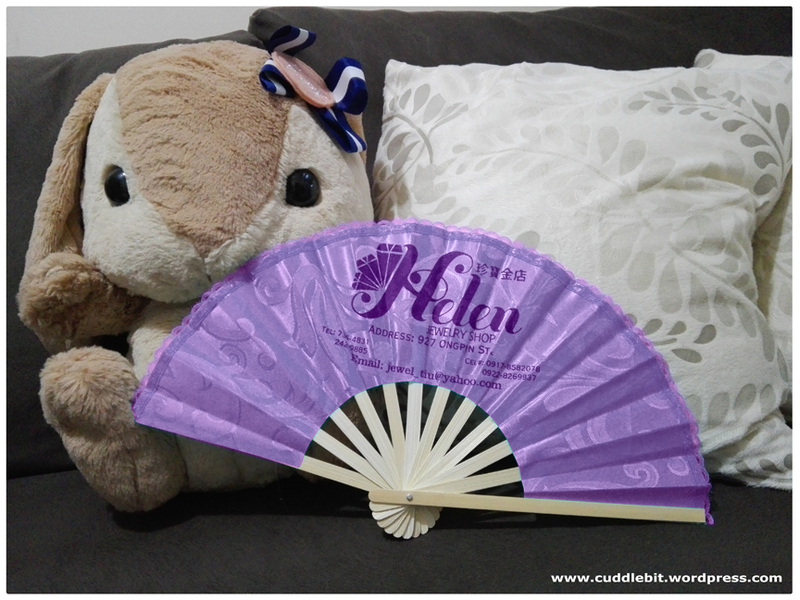 And because we visited her new shop and is considered as “friends of the shop”, she gave us a small gift! How apt! We are huge fans of her wearable artwork and investment pieces. 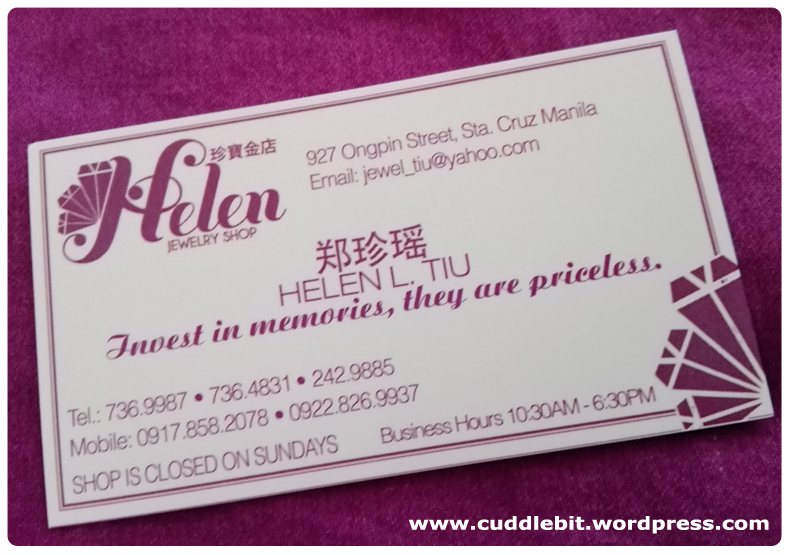 Just leaving Atchie Helen’s Contact details here in case you guys need it. Her shop is easy to look for! Its just across Mañosa Restaurant! Check out more of her creations on Facebook! *All my reviews, opinions, and other stuff expressed here are our own and based on my own experience. This is not a sponsored post. Categories: reviews, wedding | Tags: 14k, 18k, 2016, 2017, babies, binondo, bracelet, children, coral, custom, dad, diamond, engagement ring, female, gold, grandma, helen, jeweler, jewelry, jewelry education, jewelry set, made to order, male, manila, mom, necklace, ongpin, pearl, pendant, Philippines, refashion, reputable, resize, review, ring, sapphire, store, trusted, wedding ring, white gold | Permalink.